The application form to apply for AC&ABC Training can be downloaded from here. Dr. P.K.S. Madhavan, the founder of AWARE was so engrossed in his works that awards never interested him, yet he is honored with 34 different awards. He dedicated every award to AWARE’s team and millions of poor who made AWARE’s programs and activities a great success and helped Nation building process. Some of the awards he received were from Presidents of India, Chief Justice of India, Governors, Chief Minister and His Holiness Dalai Lama. Naitik Samman Award of Gulzari Lal Nanda foundation was presented by former President of India Dr.A.P.J.Abdul Kalam on 30th July, 2004 for his exemplary work of creating a mark to keep the spirit of ideals of honesty and moral values alive in the public and private life. G.D.Birla International Award was presented by former President of India Hon’ble Mr.K.R.Narayanan for outstanding contribution in Tribal Development. National Citizens Award was presented to him by former President of India Mr.Shankar Dayal Sharma for Exemplary Contributions in Rural & Tribal Development. Medal Presented by President of India, Hon’ble Mr.Giani Zail Singh, for outstanding contribution in upliftment of Tribals. Kerala Ratna Award presented by Hon’ble Chief Justice of Supreme court of India on 3rd January 2009 instituted by Global Kerala Initiative (Keraleeyam) for his outstanding contribution in uplifting downtrodden people. Governor’s Award from the Governor of Andhra Pradesh, Smt. Kumudben Joshi for courageous, selfless, dedicated service during the floods of Godavari. FICCI Award was presented by Mr.N.D.Tiwari, Finance Minister of India for his outstanding achievement in Rural Development (1987). A Memento of Award presented by His Excellency Dr.K.C.Alexander, Governor of Maharashtra on July 7, 1998 at Mumbai for the commendable work done during Latur Earthquake. Red and White Bravery Award was presented by His Excellency Shri Sushil Kumar Shinde on 15 February, 2005 at Hyderabad. for contribution in National Development, Integration Enrichment of Life and outstanding achievements in Rural Development. Chief Minister Award was presented by Mr. Vijaya Bhaskar Reddy, CM of Andhra Pradesh for his excellent work done in the Tidal and cyclone affected areas in 1977. Diwaliben Mohanlal Mehta Award was presented by His Holiness Dalai Lama for is outstanding achievement in rural Development in realizing Mahatma Gandhi’s dream of Gram Swarajya a reality. National Council for Development Co-operation-Belgium conferred Honorary membership on Dr. Madhavan in the year 1988 . He is the first and the only Asian to receive this honor. 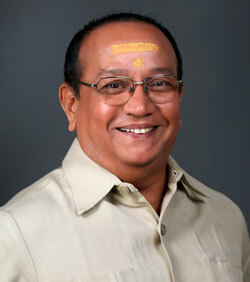 Awarded with Man of the Year title by one of the largest circulated magazines of India, The Week in 1989.
International Peace Friendship Society also selected him as Man of the Year for his significant contribution in development of Human society based on Peace, Friendship and Harmony in 1993. Jamnalal Bajaj Endowment Award was presented by Indian Merchants Chamber for his outstanding contribution in Rural Development in 1989. National Unity Award was presented by Hon’ble Mr.Sri Pada Rao, Speaker of Andhra Pradesh for his outstanding contribution in the field of National Integration in 1993. Hind Gaurav Award (Pride of India) was presented by Union Minister for Welfare, Government of India, Mr.K.V.Thangaka Balu for significant contribution in Human Resources Development and in recognition of his outstanding service in society and excellence in Rural Development. Bharat Ratna Dr.B.R.Ambedkar Award was presented by Minister for Youth & Sports Mr.D.Prasada Rao for his outstanding service in upliftment of schedule Caste and Schedule Tribes. International Peace Foundation honoured Bharatha Jyothi Award presented by Minister for Rural Industries, government of India, Mr. Arunachalam for his significant contribution in Rural Advancement through Non-violence and Peace in 1993. Priyadarshini Indira Gandhi Award was presented by Minister for Human Resource Development Mrs. Basaa Rajeswari for his outstanding contribution in emancipation of Womens Achievement of Gender Justice. NEDCAP Award for outstanding promotional work in the field of Bio-Gas in Tribal Villages in 1988-89.
International Peace Society presented Excellence 1992 Award by Mr. Nedunchezhian, Minister of finance, Government of Tamil Nadu. Visishta Seva Award was presented by Mr. K.Surya Narayan Patro, Minister for Agriculture, Government of Orissa. National Award, presented by Mr.G.Venkatswamy, Union Minister for Labour, instituted by International Peace & Friendship Society. Rajiv Gandhi Excellence Award given by Siromani Institute, New Delhi presented by Mr.R.L.Bhatia, Union Minister for External Affairs. Award for Excellence in National Development awarded by Rishi Samskruti Vidya Kendra, Goa for the valuable service rendered in making India a Swarnabhoomi in 1998. Mega Citizen Award presented by Mr.T.Sitaram, Minister for Information &Tourism, Government of A.P. for his outstanding contribution in uplifting the poor and also awarded him with title “Abinava Gandhi” in May 1998. Seva Shree Award presented for his outstanding contribution during relief and rehabilitation of Orissa super Cyclone in December 1999. Rashtriya Ekta Award presented by Ex-Finance Minister Mr.N.D.Tiwari for his outstanding services, achievements and contribution in August, 2000. Eminent Citizen’s Award presented by Rotary Club of Hyderabad. Mahavir Ahimsa Award presented to him for propagation on non-violence in the services in Rural Development, among the poor people in rural areas. Pravasi Kerala Ratna Award presented by Dr. Veerappa Moily Union Law Minister of India on Feb 20th 2010 at Bangalore. Albert Schweitzer International Foundation presented an Award to Dr. Madhavan Albert Schweitzer Medal for his outstanding contribution for upliftment of tribals in South India on 25th April, 2010. He was selected for this Award out of 102 nominations from 12 countries. A gold medal and a diploma were presented to him.